It’s 5 o’clock and I’m staring the fridge, hoping for a revelation as to what to make for dinner. I’ve got left over chicken thighs. Every other protein source is froze solid. So, I thought, what to do with you? The kids can’t stand chicken salad. So, I decided to make Chicken Pot Pie. 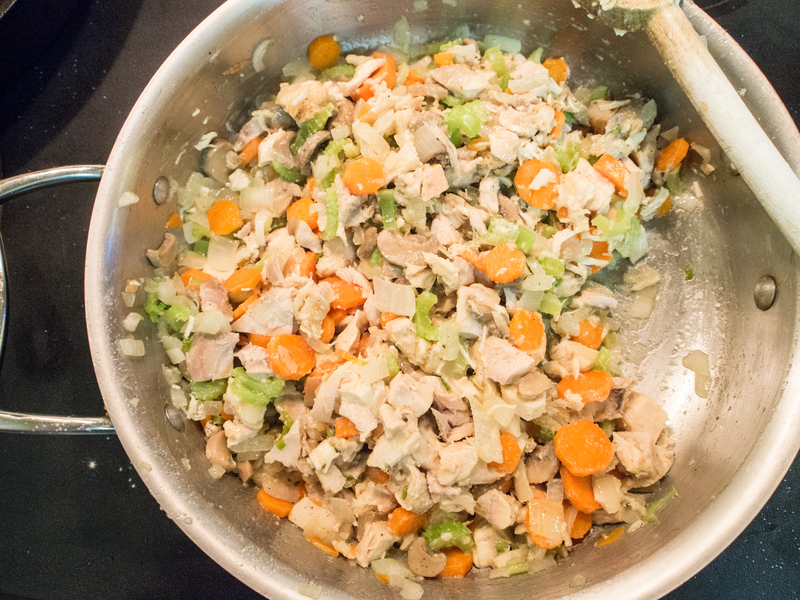 There were a variety of old recipes that involved the entire chicken being in the pot and covered with crust. That seemed a little, um, rustic. 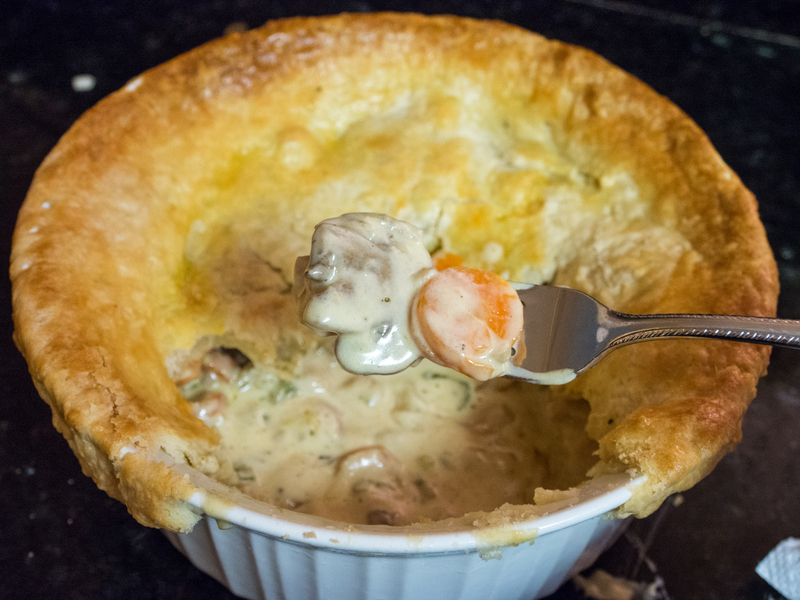 So, I gathered my ingredients on hand and transformed tired leftovers into something that used to be quite common place, but is now very exotic: a chicken pot pie. The kids were amazed at the transformation of such humdrum ingredients. In going through the historic cookbooks, “pot pies” were rather common place. I find them to be an efficient use of leftovers!! I’ll put measurements on here, but really, it’s all about what you have on hand. 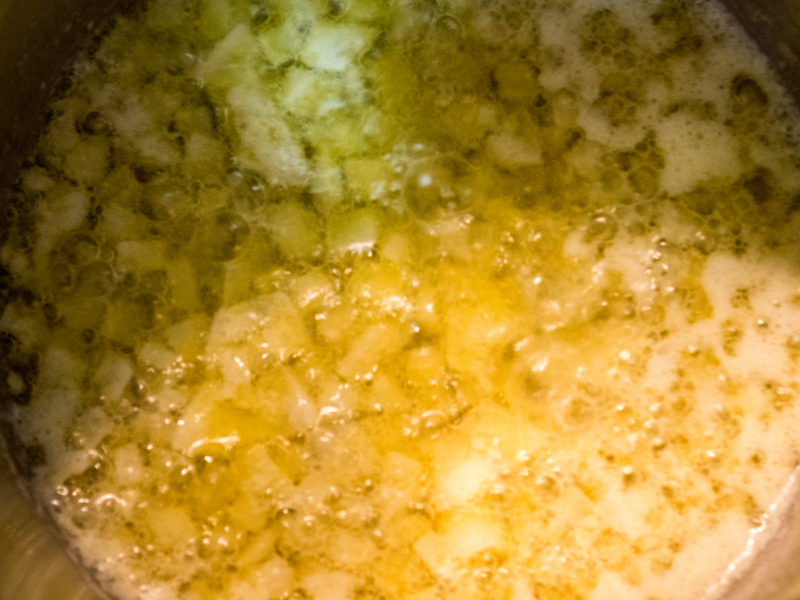 Place the cooking fat in a sauté pan over medium heat. 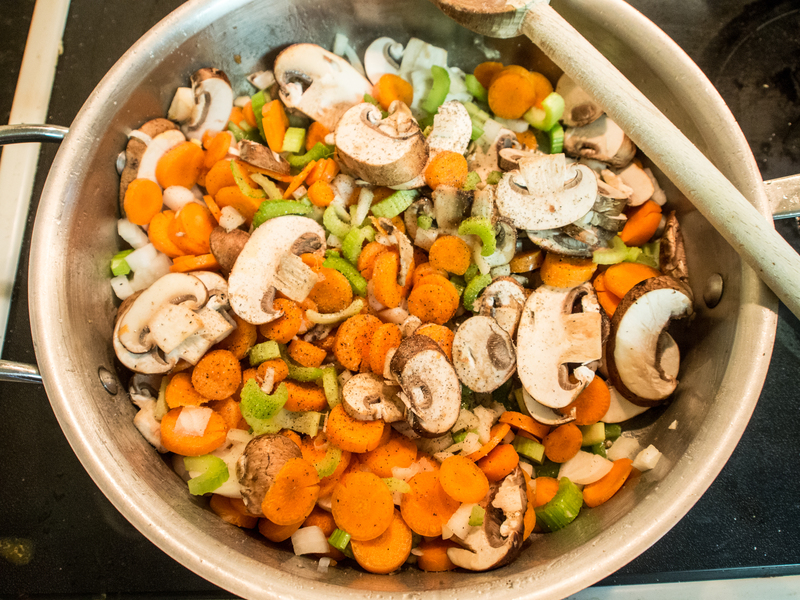 When heated, add the carrots, celery, onion and mushroom. 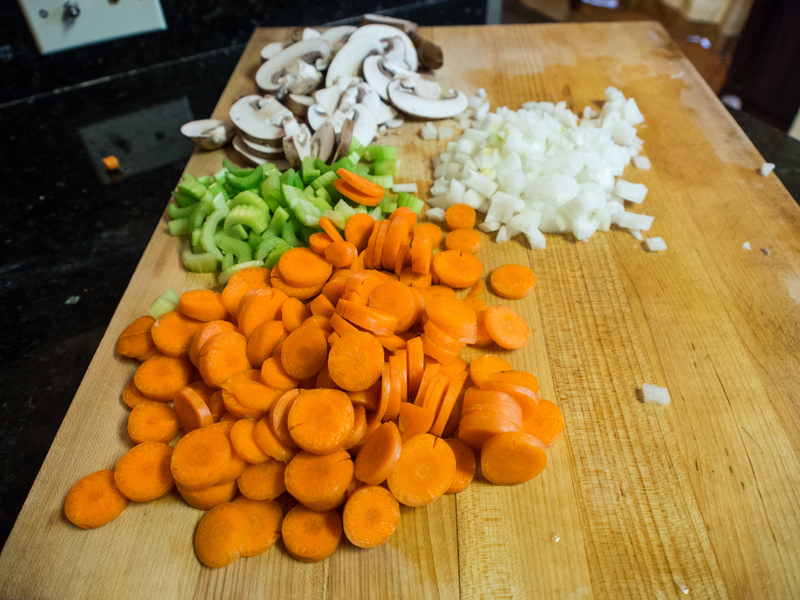 Sauté, stirring occasionally, until the carrots and celery are soft (or the texture you like them), about 15-20 minutes. Add the chicken, sage and thyme, cook until fragrant. Add the flour and cook for a bit until the raw flour taste is cooked out. Add the heavy cream and cook. The sauce will thicken. 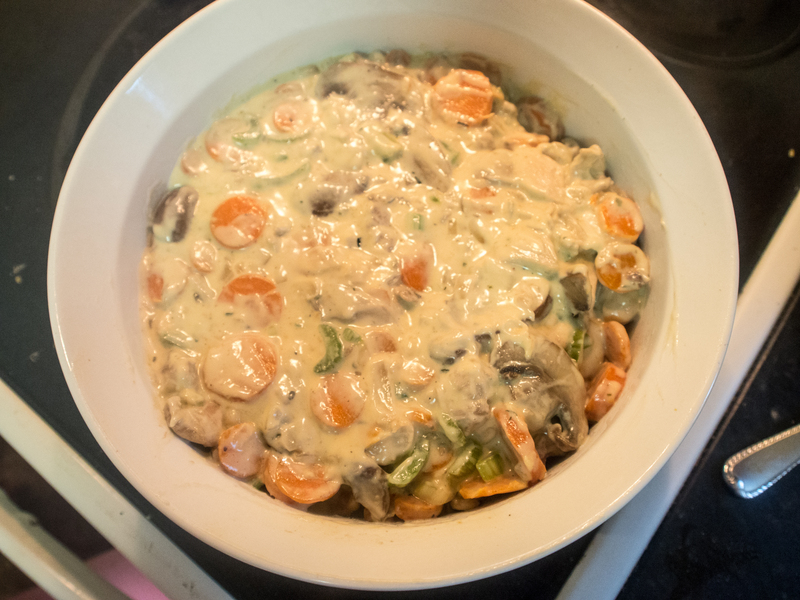 You want the sauce to continue to thicken as it cooks, about 5-10 minutes. Taste and season with salt and pepper as needed. Place the mixture in a oven proof pan (I used a large soufflé dish) and smooth the top. 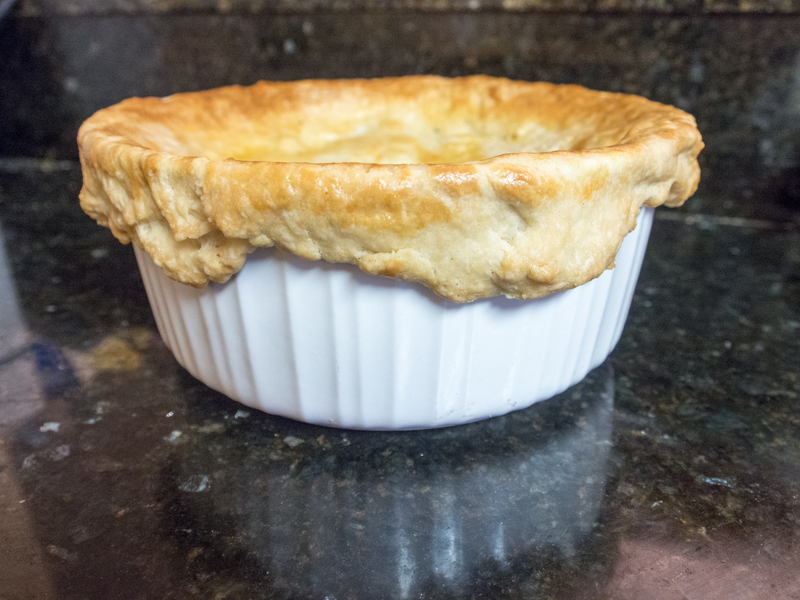 Roll out the pie crust and drape over the top of the baking dish. Pinch the crust over the top of the dish to hold the crust firm. 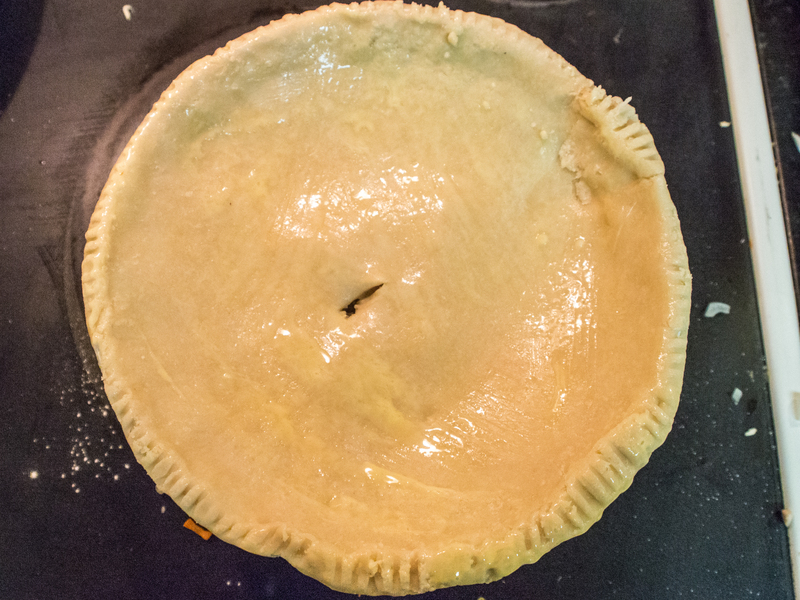 In a small bowl, beat the egg and water together and brush on pie crust. Cut a vent slit in the crust, and place the dish on a cookie sheet. Bake until the crust is golden brown, about 30 minutes. 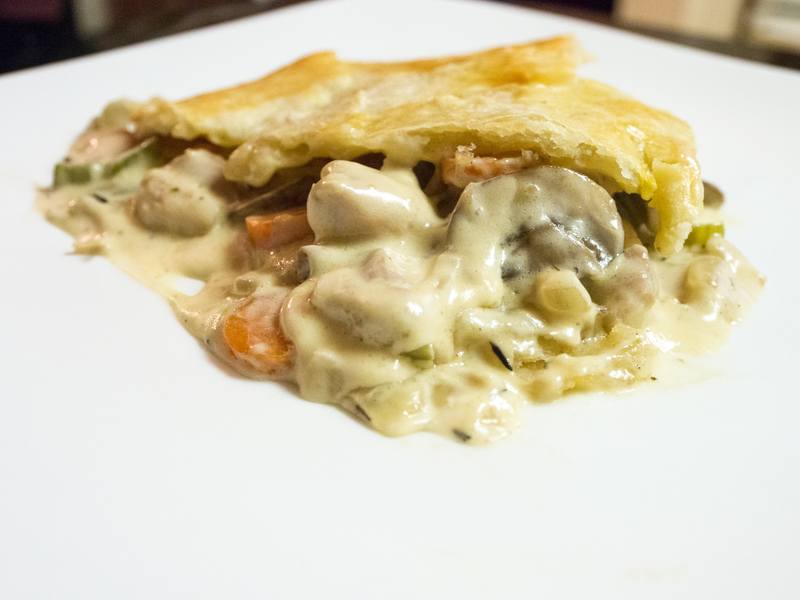 This entry was posted in Main Dishes, Poultry and tagged Chicken, easy, heavy cream, leftovers, mushrooms, pastry crust, pie crust, Pot pie on May 3, 2013 by dawn of food. Just writing the title made me shudder. Gloppy creamed spinach, who wants that? Well, to quote Alton Brown, it’s Good Eats. Really. If you make it yourself. If you buy it out of a can or the freezer section, well, I can’t guarantee it so much. Anytime I saw creamed spinach as a child, I refused to try it. It sat on my plate all gloppy and greenish. Hardly the stuff a kid wants to eat. If I was made to eat it, it was just slime. Now, I liked regular cooked spinach. To this day love it. Just the creamed part seemed to be the problem. Then, my husband took me on a date to Morton’s. He ordered creamed spinach as a side dish. I tried it and it was divine. Not gloppy or slimy. But rather thick with a creamy, yet substantial mouthfeel. I make this stuff at home and my 10 year old LOVES it. Tells me he could “seriously eat this every day”. My daughter, not so much. This is a staple on our Christmas Eve dinner menu when the theme is “Steakhouse”. I could tell you to buy pounds of fresh spinach and wilt it. But I won’t. That’s crazy. Frozen chopped spinach is made for this recipe. Buy an organic version if you are unhappy with the little retro frozen bricks in your grocery basket. Put enough water to cover the bottom of a 4 quart sauce pan, place spinach in the pan and cover. Over medium heat, thaw the spinach. Once there are no frozen parts left to the spinach (the spinach will be hot in parts, so be careful), drain well. I use the pan lid to drain most of the water and then a bunch of paper towels to soak up the rest. Honestly, cleaning bits of spinach out of my strainer is just a no. Not gonna happen again. Strain if you want, but I warned you. Set aside. In a second sauce pan, melt the butter. Sauté the onion, then the garlic. Once the onion and garlic are softened, add the flour. You want a nice, blonde roux. Sauté flour until the flour taste is gone. Don’t let the flour brown. Once the flour is sufficiently done, add the cream slowly. 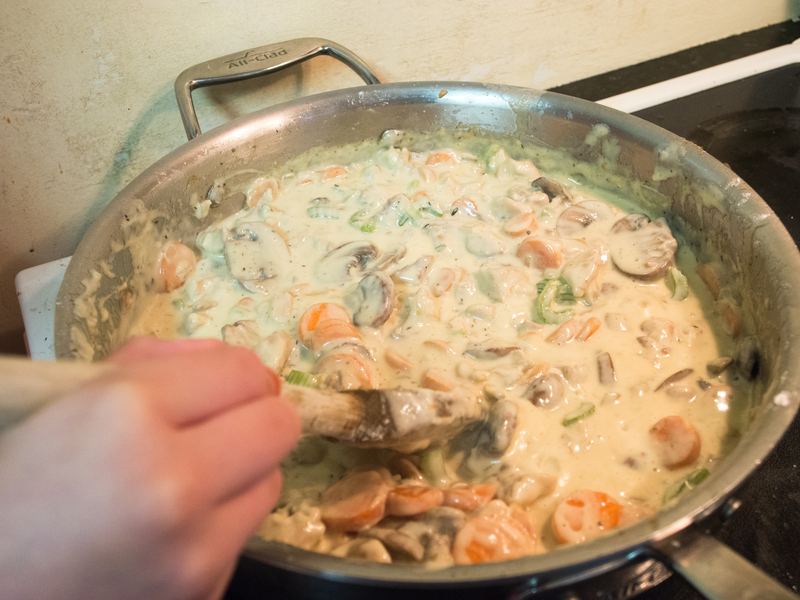 As the cream and flour meet over the heat, the mixture will thicken. Add the cream until you have a consistency that is slightly thicker than how you want the creamed spinach. You may need slightly more than 1 cup of cream to achieve this consistency. Let simmer for a minute or so and then add to the drained spinach. Stir until well incorporated. Add nutmeg and salt and pepper. For big dinners, I make this a day ahead, keep in the fridge, reheat when needed. It’s actually better with a little wait time. Butter, onions and garlic sautéing. The smell is amazing! 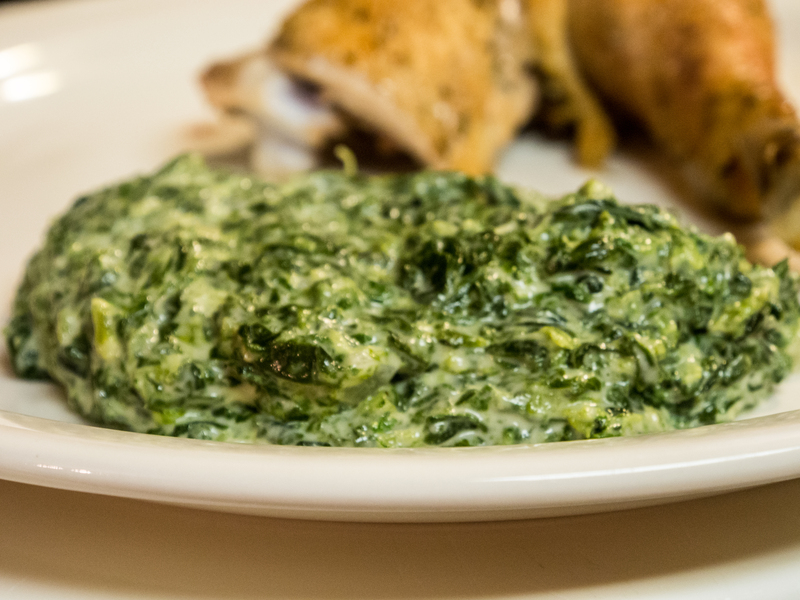 Creamed spinach with roasted chicken. This entry was posted in Vegetable Side and tagged Creamed Spinach, heavy cream, Morton's, Spinach on April 19, 2013 by dawn of food.